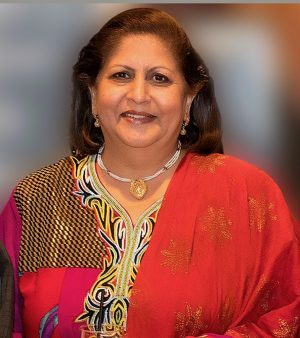 Kamna Sharma, a community leader passed away March 25, 2019. HOUSTON: Her younger son Mayoor, 35, remembered her as the adoring mom whose loving arms he could jump into from the school bus after a particularly traumatic incident in school. This Major in the US Army Reserve with two tours in Iraq fought to hold back the tears even though the dark swollen circles under his eyes told the story of many a sleepless night crying out his pain during the final days of his mom, Kamna Sharma. His older brother Rajat, 40, tall and broad shouldered, too had to compose himself several times as he eulogized his mother and remembered moments that showed the close relationships that she built, like the time she was having an afternoon aperitif with hils girlfriend and they both shooed him away so that they could have some private time together. He recalled how his mom wanted the two brothers to become what they wanted and be happy. Rajat’s biggest revelation came from a story about her compassion. He revealed that his parents, seeing great potential in one of his friends, paid for a year of his college, because he didn’t come from the same circumstances as they were being able to provide their son. For Kamna Sharma, 64, was a jovial spirit with a keen sense of humor who could find a silver lining in any cloud and become the life of the party. Several other friends came up to the podium to remember moments of their lives when Kamna made a comment or shared some news that made the others sit up and notice. One recalled how Kamna’s inquisitiveness and thirst for knowledge would lead them to ask for her recommendations spanning politics, current events, travel or even the trendiest places to eat. The jovial spirit with a ready smile passed away on Monday, March 25 after a short four-month battle with cancer of the uterus, with her loving family by her side. Even in her fading days, she was remembered for her considerate nature asking if her caregivers had eaten and cracking jokes with her friends and sons, even though she did not feel well. Kamna Sharma was born on September 7, 1954 and named after her mother Kamni Pandya in Bilaspur, Himachal Pradesh, a small town about 116 km from Shimla, where her father Shanker Ram Upadhaya was posted and later retired as the director of Agriculture for the Government of India. She graduated from Shimla University with a degree in Biology and also joined the MA program for English. Bal and Kamna owned a gas station on Voss and the Katy Freeway for 15 years, though he continued to work as Senior Mechanical Consulting engineer at the Wood Group. She was the president of the Indo American Charity Foundation and later of Club 24, both non-profits and spent many hours working on community projects. She was active in military support groups and army family readiness support groups. Kamna worked diligently to get the home repaired after it was flooded out from Hurricane Harvey and then moved back into in March 2018. Besides her sons and Bal, Kamna is survived by her grand daughter Aubrey, 4. A pooja is planned on the thervan (13th day) at the Sharma residence.